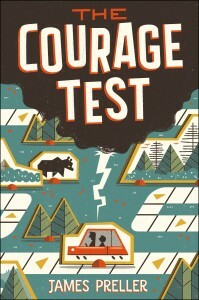 Good News: Happy to learn that The Courage Test was listed as one of “The Best Children’s Books of the Year, 2017 Edition” by the good folks at Bank Street College. A nice honor to be listed among so many great books and artists. 2016 JUNIOR LIBRARY GUILD SELECTION! A father-and-son journey along the Lewis and Clark Trail — from Fort Mandan to the shining sea — offers readers a genre-bending blend of American history, thrilling action, and personal discovery. “A middle grade winner to hand to fans of history, adventure, and family drama..” — School Library Journal.